The finalists, from left: Drake Dvorak, Ayrton Garcia, Coach Darren Utterback, Cole Paxson and Isaac Wulff. 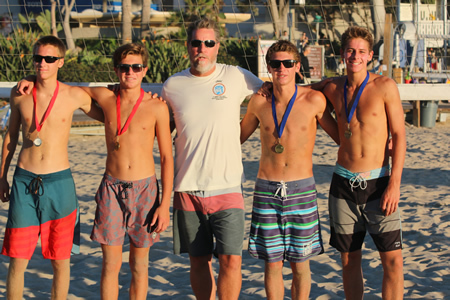 Laguna Beach High School hosted their first ever OC High School Beach Volleyball Championships this past weekend and took home the win! LBHS hosted 15 two-man teams at Main Beach from six schools. Play began Friday with three five-team pools and followed with single elimination playoffs and finals on Saturday. LBHS battled and brought in a 1st and 2nd place for LBHS. “This is the first of what we hope will become an annual event for the beach volleyball schools throughout Orange County,” said Coach Darren Utterback, who organized the event with Assistant Coach Everett Blanton and volunteer Mike Garcia. Men’s A and Women’s B beach volleyball tournament will take place on Saturday, Oct. 17 and men’s B and women’s A will be played on Sunday, Oct. 18, both at Main Beach. This round robin king and queen of the beach format tournament is for competitive players. Pay with PayPal or mail a check to Kirk Morgan, P.O Box 11, Laguna Beach, CA 92652. Payment on the day of the tournament does not guarantee a spot. Adult drop-in soccer kicks off in Laguna Beach. Games will be played on Saturdays from 8-10 a.m. at Laguna Beach High School. They are co-ed and all skill levels are welcome. Cost is $7. Please wear shin guards. Secure a spot at www.meetup.com. Royal-Soccer-Pickup-South-OC or call Alexis Braun at 949-497-0762.